So I spent a little more time with EVE Online last night, trying to reacquaint myself with the practice of scanning. In EVE, to find entrances to wormholes, sweet mining areas and so on, you need specialized equipment — scanner probes — and several of them to “scan down” a site, as they call it. This involves using usually six scanners (four laterally in a square or diamond, one above, one below) to pinpoint the exact location of a wormhole entrance or whatever else one might find. I love this sort of thing in space games. I personally find scanning relaxing and fulfilling, as you can find some exciting stuff — wormholes are always fun, and dangerous, for example. This got me to thinking, however…in all the spacey MMO’s I’ve played….Jumpgate, Earth & Beyond, Allegiance and EVE Online — sadly there have really been so few — I rarely, if ever engage in Player vs Player (PvP) combat. I’ve done it maybe once or twice in EVE, but that was it. I then began to wonder why, exactly, when I’m playing single-player spacey games that I’m all about the combat, but in games with other people, I prefer to take on a support role such as scanner, miner — lord do I love mining — scout, mission runner and so on? At first I thought it was because I would get smeared by other, better pilots — and I probably would to a degree — I realized that wasn’t it either. In broadening my thinking about it, I realized that these MMO’s are the closest thing I’ll have to living spacey universes with a spaceship to fly around in. I then thought to myself, if I were lucky enough to be alive during a time wherein space travel was possible, I likely wouldn’t make my living strictly as a combat pilot. I’d prefer to eek out a living as a mission running mercenary, or an asteroid prospector, or a transport captain. 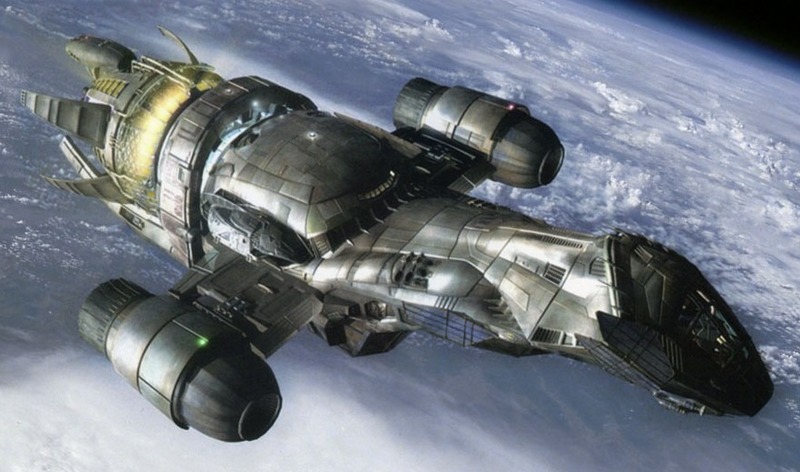 This is probably why I like the TV show Firefly so much, because that’s honestly the kind of life I’d want to live in the future if I had my druthers about it. This, I realized, doesn’t apply solely to MMO’s either. In Frontier: Elite II, for example, I made much of my wealth doing trade runs and completing missions, many of which consisted of transporting cargo or passengers. In Starflight, I made much of my wealth tagging planets for colonization, mining and selling artifacts. Therefore, I s’pose that, if a game is focused on combat, I’ll happily jump into the fray and blow up as many spaceships as I can. However, if the universe in a game allows for more options, I’ll happily live the life of a trader, mercenary or prospector, for example. This fits more with my ideal of how I’d live in a spaceship, if I were lucky enough to do so. I like trading and exploring. I dislike when a game is all about this or that. In EVE in particular I tend to mine and whatnot in order to build things. I enjoy that. In the X games, I tend to build up a trading/manufacturing empire. I totally get what you're saying about the living world. We really need more space mmos that aren't quite as … EVE-like. Heh, combat in EVE is meh, but it's passable. I personally found the X games so damned focused on economy that I found no fun in them. Didn't help that the universes felt so…bland and empty. Jumpgate did a great job with this sort of thing, but sadly it's not really worth playing anymore. :( Sad, as that's probably the game I've played more than any other. I'm of the same mind, if the game only offers combat (like S.P.A.Z.) I'm happy with the fighting, but if there are other roles I like to explore them as much as possible. it's a waste of game. Did you ever play Jumpgate. It really sounds like it was right up your alley. Cheers Brian, definitely will check this one out. Yep, seems the sign-up page is down, I'm guessing I missed the boat on this one. Boo! you should try Space Merchant Realms, http://smrealms.de/login.php or Core exiles, http://www.core-exiles.com/ . I haven't undocked in eve for the past few months. This game has become all about trading and accumalating wealth for me. Who needs pvp.